I talked to Randy, for just a couple of minutes, when they stopped in Iowa so he could drive again. He said it was weird to sleep while the truck was moving, but he still has insomnia no matter what so it didn't make much difference to him. They are on their way to Normal, Illinois, and they will be back in Salt Lake tomorrow night. He thinks they're supposed to leave again the same night, but he's not sure where. Apparently, his trainer has several regular runs (Illinois, Ohio and South Carolina), so they're not doing just one thing over and over (that's good). 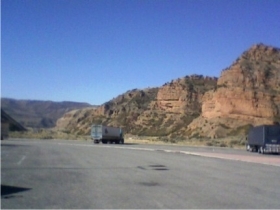 A beautiful shot of the Utah scenery while cruising along as a truck driving student. Well, I got another 1-minute call 11 hours later from the big truck stop in Iowa, after their trip to Illinois and back. Randy drove all day, while the trainer mostly slept and rested. He was tired, but very excited about how he backed up the trailer at the dock, unhooked it, backed up to a new one and hooked it up like he'd been doing it for 20 years! That's nice, but I told him he needs to call me from the sleeper. ;) Seriously, I know he's busy but I just want 10-15 minutes out of every 24 hours...I don't think that's too much to ask, is it? The answer is no, and I got it! When I asked if he missed me, he said, "yeah, I guess" and giggled at me. That's what happens if he thinks someone else may be listening, he's like 12. I've heard people refer to trucker's wives as "married widows". I'm not even quite a "real" one yet, but that's how it feels alright. :( When Randy called tonight, I was actually researching divorce stats for truckers. Did you know there's a Frank Zappa song titled "Truck Driver Divorce"? Randy's trainer is on his 4th marriage. He called me from the trainer's house, and they just had a nice meal and a shower and were getting ready to head out to South Carolina. The trainer told him this trip will have all the hard stuff for him to learn. It sounds like he's had some of that already, and has dealt with lots of mountains. He told me about coming down the highest peak in Wyoming (5% grade) and he was SCARED. He had the jake on, and used the regular brakes too...I was worried about that, after reading how some O/O's don't want to wear out their brakes and go downhill incorrectly. And he's been up and down the "Sisters" twice, with lots of road construction going on besides! Fun (not). The trainer is amazed that Randy is averaging over 7 mpg, and said he's never gotten that kind of mileage. Because, HELLO, the trainer drives fast! 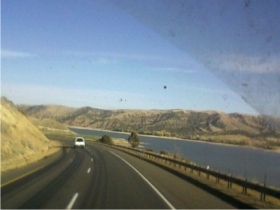 Another great scenery shot - it's rather nice having an office with a view. Randy called me while he was driving through parts of Wyoming and Nebraska. For him, I will temporarily give up my no-driving-while-on-cell phone rule. He said he's doing great other than having a little trouble shifting while taking off ramps, but he'll get used to it. That was early in the afternoon and he was supposed to call me back tonight, when he was in the sleeper. But 13 hours later, he didn't. So I'll assume he's exhausted and/or has no privacy. Well, duh! He sounds so stiff and uncomfortable now...if I didn't know better, I'd think his mother was in the truck with him! ;) Whatever is happening to him, I'm starting to think I won't find out until he's back at the school again around Saturday. P.S. He just texted me that he's too tired to talk. Well, then I have to wonder if he was safe to drive either. I hope so, since he seems to be doing an awful lot of the driving. I got to talk to Randy several times today, but I went for over 24 hours without talking to him at all...that makes my stomach nervous! The first time he called he was driving on a curvy mountain road in the rain and fog, while the trainer was sleeping (without any special instructions or guidance). Before that, they stopped at Subway and Randy ate while he drove. ??? Am I the only one that thinks all of this is bad for a brand new driver? To any trainers or former trainers out there...is this normal? It seems fairly careless to me...am I overreacting? I don't want to ride with him if he does that kind of stuff. To remind him of how life goes on here, I sent Randy a pic of my right foot, which is turning blue/purple and the doctor doesn't know why. I can't feel it half the time, and it's the foot I was supposed to press the accelerator and brake pedal with. :( Which is why I'm stuck here instead of driving around slippery mountains talking on the phone and eating sandwiches while my trainer sleeps. ;) My "clutch" foot is still good though, for all that's worth. Randy said when they were going through Wyoming the other day, he saw 2 trucks that he pinstriped...Pat Fruth Trucking from Shakopee, MN. It really is a small world. Except it feels really big when he's so far away.